Planning a nursery? You can’t go wrong with a bright and modern space. With its emphasis on functionality, modern design is a practical choice for busy moms. But “functional” doesn’t have to mean ugly. Modern design is best described as “the place where form and functionality meet.” It’s about creating beauty in a simple, workable space. First and foremost, keep things simple and clutter free. The goal is to use only what you need; the trick is to make the things you need beautiful. In modern design, everyday objects can be a work of art. Look for clean lines and sculptural elements, and splurge on stylish light fixtures. Opt for a neutral color palette and keep your nursery theme subtle while emphasizing understated elements of design like texture and pattern. Second, remember that how you use your space is as important as how it looks. Be sure you can easily lay your hands on the things you need, and consider using hooks and cubbies for easy access. Look for versatile pieces and add wheels to furniture for added functionality. Finally, leave babyish behind. A modern space is a sophisticated space. It’s a space your little one can grow into and enjoy for years to come. Create a room an adult would love, and then fill it with the things your little one will adore. Need a little inspiration? These gorgeous modern nursery rooms are guaranteed to give you the right idea! This beautiful nursery space, created by the design team at Rehabitat, is the perfect example of modern minimalism at its best. Clean white walls, understated furnishings, and plenty of uncluttered floor space give the room a bright, airy feel and a prevailing sense of openness, proving that less can be oh so much more. Inspired by a trip to Morocco, this simple yet chic space, designed by the style maven behind the popular wedding blog Ruffled, combines clean modern style with exotic flair. The two-toned midcentury-inspired crib and the graphic print accent wall with its adorable full-color camel make the perfect statement in this otherwise understated space, allowing a rich yet muted collection of Moroccan-style textiles to blend in seamlessly. This beautiful baby girl’s room, spotted on 100 Layer Cake-let features clean lines, minimal dressings, and a healthy dose of modern Boho chic. The large-scale floral print, richly textured rug, and dramatic potted plant are all hallmarks of this new and popular take on Bohemian style. A focus on balance and shape combined with tribal accents, woven textiles, and earthy touches of green make this “modern Boho” twin nursery, designed by Natalie of Nat Your Average Girl, more than stylish enough for two! Pops of bright kelly green bring life and energy this fun and modern boy’s room shared by Oakley Peterson of Nothing Down About It. Black and white spaces featuring modern lines and graphic prints and patterns have been popular in recent years, but the addition of a strong, knock-your-socks off accent color gives this bold space a refreshing twist. This sophisticated nursery space, featured on Project Nursery, is the perfect example of what is becoming a very popular trend: nurseries that don’t look like nurseries. Former bachelorette, Emily Maynard, wanted a simple, modern space for her little one; something that would feel instep with the rest of her home and would grow with her child. With its clean lines, modern furnishings, rich textural accents, and bold abstract art, this black, white, and gold beauty more than fits the bill. A one-of-a-kind graphic chalkboard mural is a showstopper in this modern take on the woodland nursery, spotted on Grey House Studio. By taking the understated, geometric approach, this adorable, gender-neutral space, featured on Project Nursery, offers a subtle nod to the rustic woodland trend without compromising its clean-cut, modern style. Want to make a bold statement without sacrificing a clean and contemporary design? Try emphasizing a single design element in a big way. The large-scale wall mural in this white on white nursery by Emily Henderson Interiors, stands is stark contrast to its relatively simple surroundings, drawing the eye and heightening the drama in this bright and modern space. A large-scale Boho cactus print sets the scene in this modern nursery room from Tellkiddo where vibrant green plants bring an unadulterated dose of life, energy and color to this richly textured, gender-neutral space. A generous splash of pink with rich navy and gold accents makes this sophisticated midcentury-inspired nursery, designed by Elisabeth McKnight, all girl. The dresser, oversized mirror, and abstract statement piece are a classic midcentury fit, and the plants and gorgeous print rug add the perfect touch of trendy Boho. In modern design texture and pattern rule, adding richness to an understated aesthetic. This rich, neutral nursery space, spotted on Instagram, puts both of these key elements to good use, creating a warm and vibrant space without the aid of color. This bold boy’s room, spotted on Snappy Casual, centers around a black and white geometric motif punctuated by a dramatic black wall. Clean lines and a minimalist approach keep the space looking sharp and modern. This bright and airy nursery space, spotted on Small Fry, incorporates soft pastels, comfy textures, and lots of natural light, creating a modern yet soothing haven for baby. This cheery little nursery, featured on Apartment Therapy, boasts a lively mix of graphic patterns all tied together in a clean-cut black and white color scheme. A sculpted geometric pendant lamp in glossy black adds the perfect touch to this modern space. 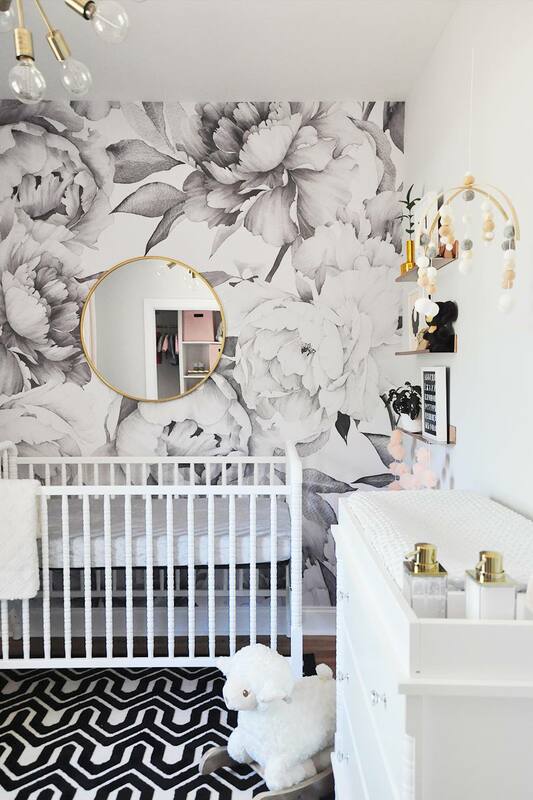 With its clean lines, sparse accessories, and an emphasis on balance and symmetry, this swoon-inducing nursery for two, featured on Style Me Pretty, boasts plenty of modern appeal. A dynamic duo of bold prints and gold accents add the perfect touch of glam for a look that’s sophisticated and chic. 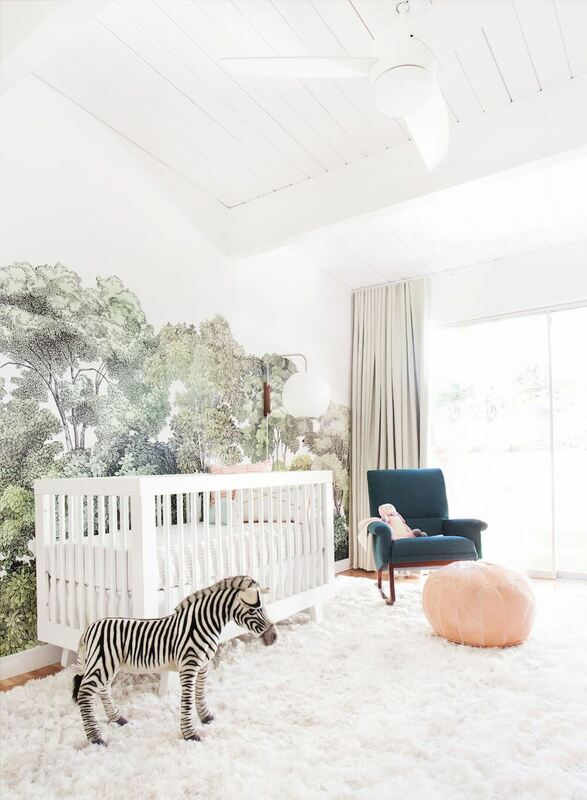 This sweet little tribal nursery, created by Regan Baker Designs, proves that modern décor and popular nursery themes are not mutually exclusive. The trick? Go understated. Start with a simple modern space and incorporate a few key elements to suggest your theme. Created by Suzann Kletzian Designs, this modern nursery in rich navy and gold, offers a subtle take on a celestial theme, using metallic dot decals to suggest a glimmering night sky. Star maps and other celestial charts adorn the walls, enhancing the concept without overwhelming the room’s chic contemporary aesthetic. Bright, clean, and thoroughly modern, Nordic design seeks to create functional, kid-friendly spaces that inspire a sense wonder by putting an emphasis on imagination and play. Lively patterns and whimsical art prints and accessories bring this simple, modern Instagram find to life, giving the room its unique charm. This one-of-a-kind nursery design featured on Apartment Therapy combines mid-century style furniture, funky accessories, and abstract art into a single fun and modern design. An oversized graphic print and some triangle decals add the perfect touch of whimsy to this sweet, contemporary nursery spotted on Kukun.